Pyramid Credit Repair is a credit repair service that offers a wide range of removable items, personalized service, and a 90-day money back guarantee. Since 2010, Pyramid Credit Repair has provided countless clients with their reputable credit repair services. They are headquartered out of Delaware and have teams in several locations: their sales team is based in Texas, their customer care is based in California, and their legal team is in New York. During your free consultation, a dedicated dispute manager talks you through your credit situation and lets you know if you are Pyramid Credit Repair is the right service for you. Their credit repair experts are certified in-house and undergo extensive screening and training. You can sign up on Pyramid Credit Repair's website or by phone. Once you have endorsed the electronic agreement and uploaded your required IDs, the credit team will begin preparing disputes with the three major bureaus (Experian, Equifax, and TransUnion) based on the information provided during your credit assessment. This usually takes 5 to 10 business days, although the time frame may vary depending on your situation. Your personal account manager will send instructions on how to get your credit reports from the three major bureaus: Experian, Equifax, and TransUnion. Around 24 hours after you are registered and have run the Credit Wizard, you receive access to a live personal account manager, your three bureau credit reports, a cloud-based online dashboard, progress reports in real time, and a score tracker and analysis. Your personalized dashboard allows you to keep track of any progress. Additionally, your dedicated account manager keeps in close contact by texting, calling, or emailing you with updates and reminders. You typically see results 4 to 6 weeks after bureau disputes. Each time your credit report changes, your account manager schedules a 20 to 30-minute call to discuss the plan for the following round of disputes. Money back guarantee: If you are not satisfied with their service, Pyramid Credit repair offers a 90 day 100% money back guarantee. Direct communication: Pyramid Credit Repair keeps a direct line of communication with you. Wide range of removable items: Charge-offs, liens, collections, late payments, bankruptcies, late payments, repossessions, judgments, identity fraud, and foreclosures can be removed from your credit reports. Fast, legal, and effective credit repair: Each case is unique, but Pyramid Credit Repair typically shows initial results in 4 to 6 weeks. No cancellation fee: You are not charged any fees for canceling. Great customer reviews: Many clients reported good customer service, quick responses, and around the clock assistance. Personalized service: Each account manager has no more than 30 clients, so you will receive quick responses. Account managers may also provide you with a phone number in case you need to text or call them after business hours. The monthly fee for Pyramid Credit Repair is higher than some of its competitors. Pyramid Credit Repair does not offer a pay-per-deletion plan. Their services may not be available in all states. Pyramid Credit Repair is not listed with the Better Business Bureau at the moment. Pyramid Credit Repair is one of the few credit repair companies that offers a 90-day money back guarantee. However, they are not available nationwide. Pyramid Credit Repair Singles Service: $0 to start, $99/month thereafter to sustain access to your Dedicated Account Manager and all the financial tools to help keep your life on track. Pyramid Credit Repair Couples Service: For $198/month, you and a friend, relative, or partner are given the same benefits at the couple’s price. However, couples receive a 50% discount during the first month of service. If you are signing up with a spouse and you have a joint account, you are encouraged to sign up at the same time. You can also sign up for a couple’s discount with your significant other, a friend, or a relative. Keeping your accounts separate will speed up the turnaround time. There are no upfront fees and you are not charged until services are rendered, which usually takes 5 to 10 business days after sending your required documentation and endorsing the agreement. 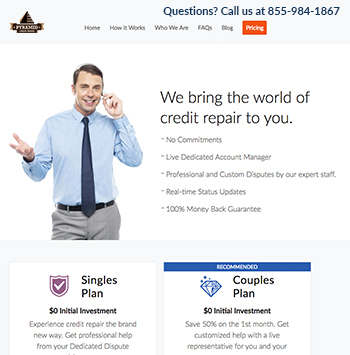 How does Pyramid Credit Repair compare to its competitors? Pyramid Credit Repair is known for their quick responses and provides a 90-day money back guarantee in the case their services do not work for you. The Credit Repair Organizations Act (CROA) sets tough laws to ensure company compliance and protect consumer rights. For example, the CROA states that no credit repair organization can bill a customer until services are performed. However, many companies charge a “first work fee” in order to acquire credit reports. A for-profit company must also accurately inform you of what they can and cannot do in addition to providing a written contract and allowing the contract to be canceled within three business days of signing. If you ask, a legitimate company will inform you that you have the right to fix your own credit. Companies that guarantee to erase bad credit or raise your credit score by a high amount very quickly is a red flag. Because Pyramid Credit Repair follows all of these guidelines, they are a trusted credit repair service.